SHERIDAN – You know it’s spring when the baseballs start coming out, and in Sheridan, Little League is moving ahead, gearing up for baseball season, which began April 13, the town council learned at its Monday, April 8, meeting. 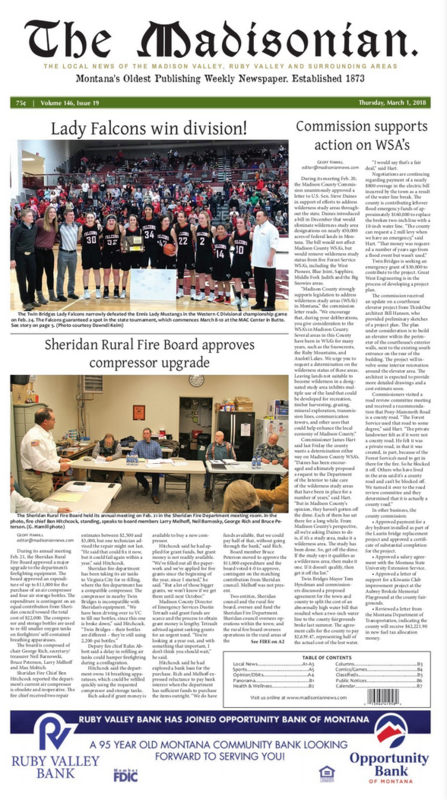 SHERIDAN—The Sheridan school board held its monthly meeting on Tuesday, October 9, and focused particularly on the importance of creating its strategic plan and a commercial energy renewal for the next year. That’s how Arnie Rosdahl begins the manuscript that will someday turn into his autobiography. SHERIDAN – Water rates in Sheridan may soon be changing. The town council is looking at raising the rates it charges for water. The council approved a “resolution of intention” to change water rates at its July 9 meeting. SHERIDAN—At the end of May, the Ruby Valley Healthcare Foundation received the deeds to two properties in downtown Sheridan, an enormous donation in support of the Ruby Valley Hospital and the larger community. It was a transfer that had been in the works since the fall of 2017, says Foundation President Les Gilman. SHERIDAN - An undertaking that began in March of 2017 in Sheridan should be finished and open by the end of the summer. The new Ruby Valley Hospital and Medical Center is quickly nearing its completion, and staff toured their new facility on Friday, June 21.